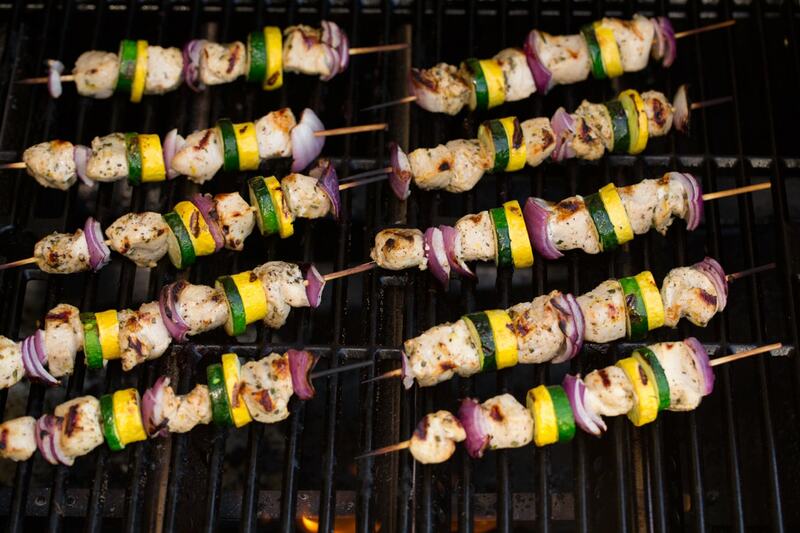 Before summer is gone you need to try these Lemon Pepper Chicken Kebabs at least once! 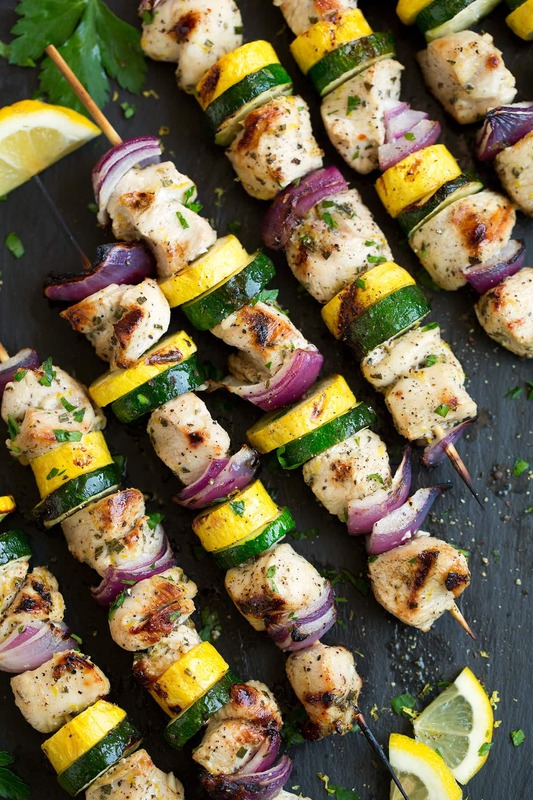 Bite size chicken pieces are soaked in a fresh lemon pepper marinade then threaded onto skewer sticks with tender summer veggies and perfectly grilled to get that delicious char. It’s a dinner everyone will love! Lemon Butter Chicken – fan seared and covered in a rich buttery lemon sauce. 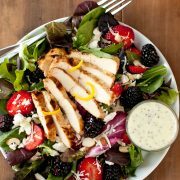 Lemon Chicken Romano – crispy coating and so much melty cheese. 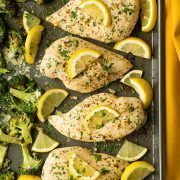 Sheet Pan Lemon Chicken with Parmesan Roasted Broccoli – perfect busy weeknight meal. Grilled Greek Lemon Chicken – similar to this recipe but more herby. Roasted Lemon Garlic Herb Chicken – you’ll love that crispy golden brown skin! 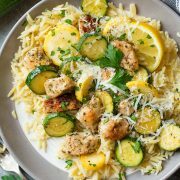 Skillet Lemon Parmesan Chicken with Zucchini and Squash – a quick dinner, perfect with orzo. Slow Cooker Greek Lemon Chicken and Potatoes – a perfect one pot meal. 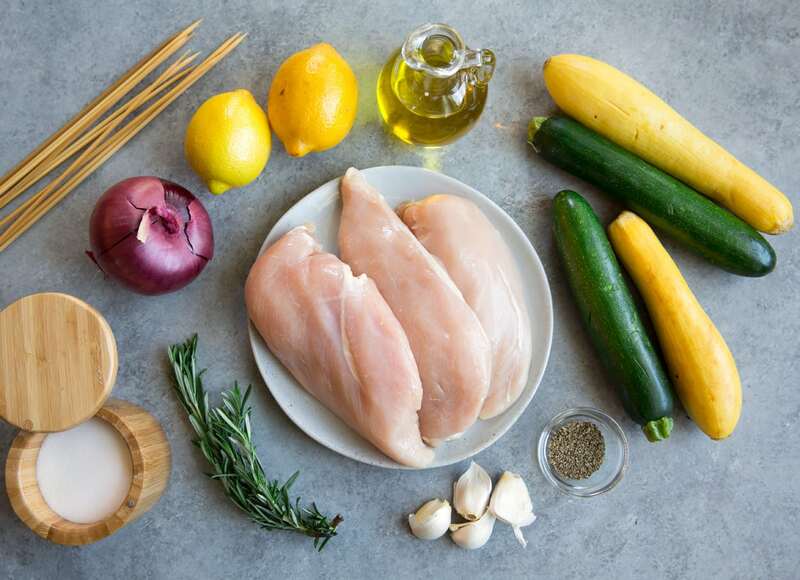 You can never have too many different lemon chicken recipes right? 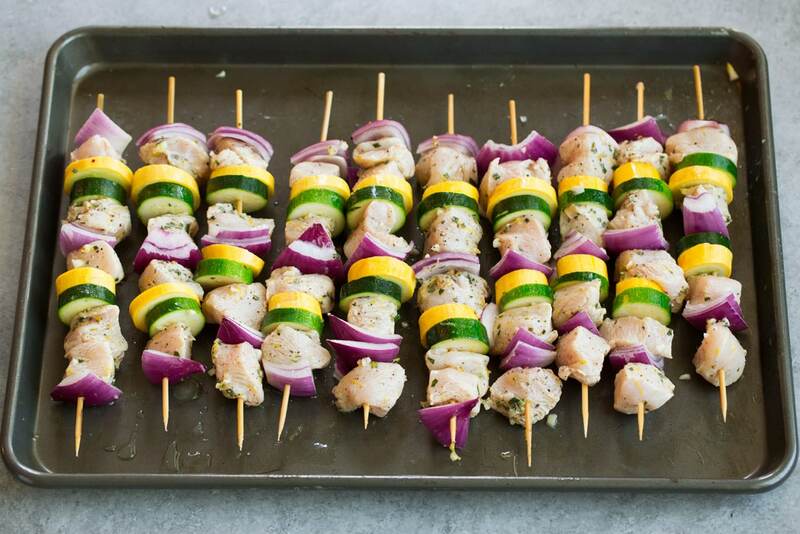 And these Lemon Pepper Chicken Kebabs are one is a new summer staple recipe! I love the tangy lemon complimented by the kick of the black pepper, such a good pairing. First you’ll whisk together the marinade ingredients, olive oil, lemon juice and zest, garlic, rosemary, salt and pepper. 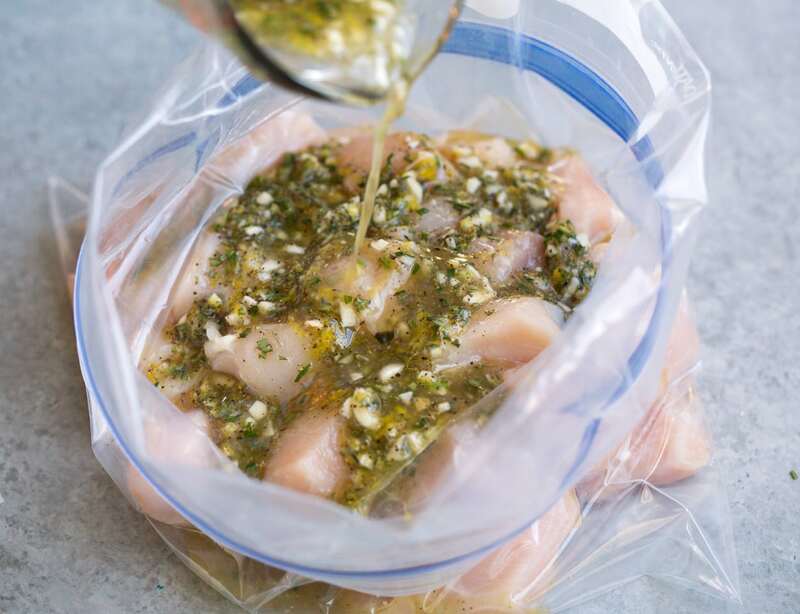 Place the chicken pieces in a gallon size resealable bag, pour marinade over chicken the seal bag while pressing out excess air. Rub marinade over chicken and let marinate in refrigerator 1 – 2 hours. Preheat grill to medium-high heat. 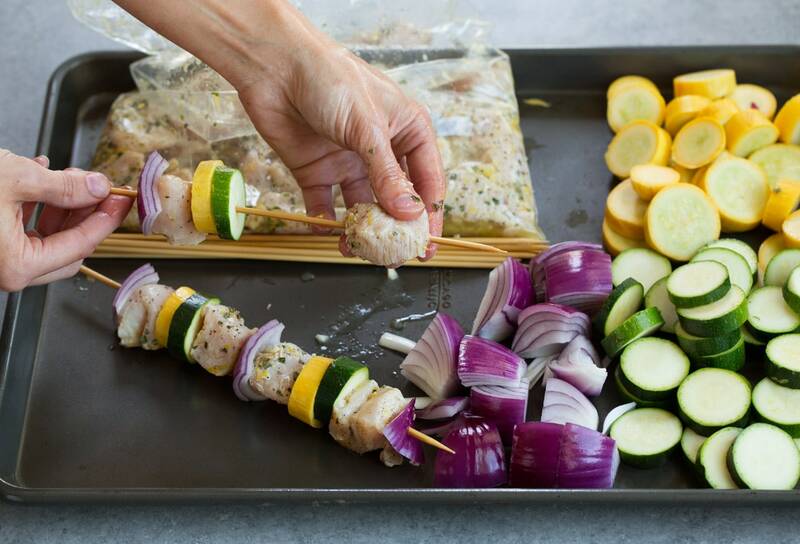 Remove chicken from marinate then thread onto (water soaked) wooden skewers or metal skewers, along with disks of zucchini and squash and red onion pieces. Grill kebabs until cooked through, turning once halfway through, about 5 minutes per side (center of chicken should register 165 degrees on an instant read thermometer). Serve warm. If you have bell peppers (chopped), grapes/cherry tomatoes or mushrooms those would be other good vegetables to substitute here. Then serve these with buttered parmesan rice, cauliflower rice or orzo to complete the meal. 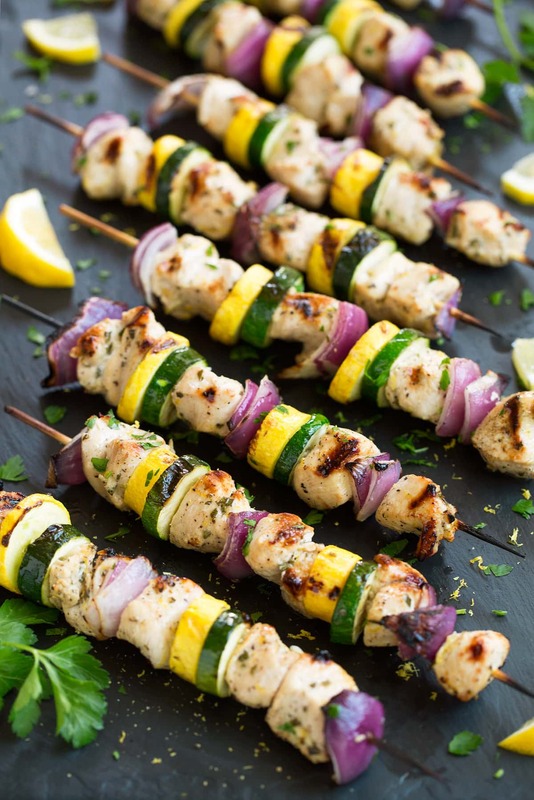 Bite size chicken pieces are soaked in a fresh lemon pepper marinade then threaded onto skewer sticks with tender summer veggies and perfectly grilled to get that delicious char. It's a dinner everyone will love! Transfer to refrigerator and let rest 1 - 2 hours. If using wooden skewers soak in water at least 1 hour.